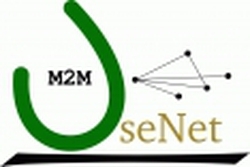 The UseNet project is developing universally applicable service concepts based on machine-to-machine (M2M) communications for producing new M2M services. The aim is to enable ubiquitous use of M2M services provided by different types of machines and devices that are connected to heterogeneous and extended IP communications networks as easily and smoothly as possible. In interaction with the domain-specific M2M applications, the key UseNet objective is to define a generic UseNet M2M service concept for ubiquitous M2M service networks.